It is said that the rituals of Chhatth Puja may even dates back to ancient era, in which it finds a mention in the ancient Vedas, as the Rigveda features hymns adulating the Lord Surya and exemplifies similar customs. The custom also finds a reference in the Sanskrit Epic poem of Mahabharata in which Draupadi is described as observing the same rituals. According to the poem, Draupadi and Pandavas- the rulers of Indraprastha (today’s Delhi), performed the rituals of Chhath Puja on the recommendation of noble sage Dhaumya. Through the adulation of Lord Surya (Sun), Draupadi not just came out of all her troubles, but also helped the Pandavas regain their lost kingdom later. 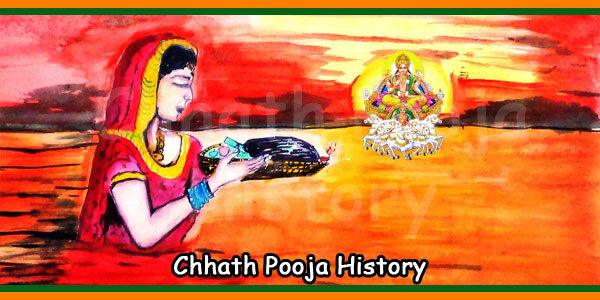 The yogic or scientific history of Chhath Puja dates back to the Vedic times. The rishis of yesteryears used this method to remain alive without any external intake of food and were able to obtain energy from the sunlight. This was done through the rituals of the Chhath Puja. Another history reflecting the significance of Chhath Puja is the story of Lord Rama. It is believed that Lord Rama & Mata Sita had kept fast together and offered puja to the Lord Surya in the month of Kartik (in between October and December) in Shukla Paksha during their coronation after returning to Ayodhya from an exile of 14 years. Since then Chhath Puja became the important and traditional festival in the Hindu religion. It started celebrating every year in the same month on the same date by people in the Hindu religion.